As explained in this article our primary concern was getting a 'good' deal and this meant to a large extent thinking about resale potential and reliability. At any one time the second hand motorhome market contains a lot of unique motorhomes. We found the best strategy for us was to remain open to almost all possibilities, searching as broadly as possible. However, we did still have some preferences and parameters of our own and these are outlined below in steps 1 -5, which reflect the order we prioritised different features and specifications and the how we went about using the online listings. Price: We considered everything from up to £20,000. Our preferred budget was up to £13,000 (with some wriggle room for the right deal) but as this put us pretty close to the cheapest end of the market, we increased the price search limit to up to £20,000 to catch any 'good' deals for which we'd consider spending a bit extra of our savings. This filtered out the very smallest vans, well actually 'car' based motorhomes i.e. Citroen Romahomes, converted Berlingos etc. which were too small for an extended trip. We never really considered a petrol motorhome. There are less of them about and do seem to be cheaper for the same specifications as a diesel model but we've had diesel cars for many years and the fact they get higher mpg, plus the fact diesel is the cheaper fuel outside of the UK reinforced our choice to stick with a diesel engine as it would save money on running costs. Some large motorhomes (4 berth and over 6 metres) seemed to offer better value for money. The more compact motorhomes with intricate design and space saving features actually attracted bigger price tags. But for us there were three reasons why we chose to limit the length of motorhome we would consider. 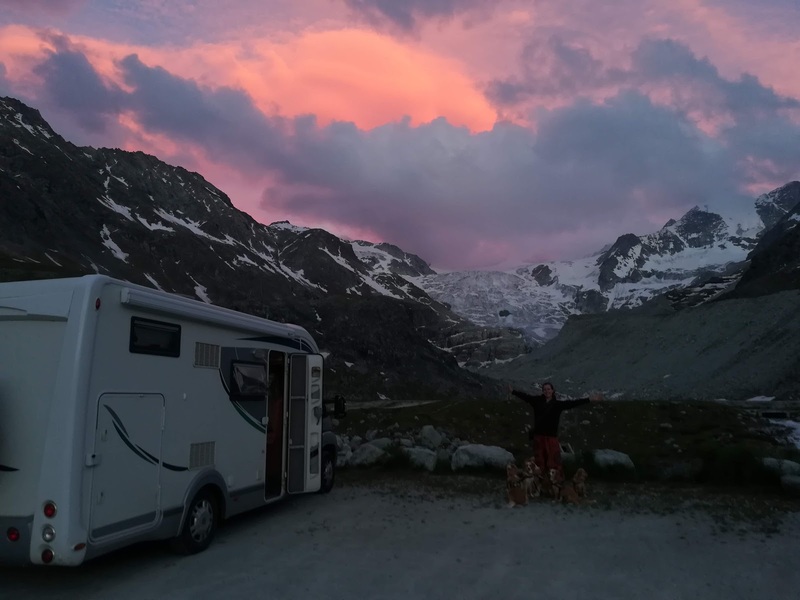 Firstly, we wanted a relatively small motorhome that we could easily manoeuvre (as it was our first) but large enough to provide a comfortable living space for a year. 6 metres seemed like a good balance. Plus we knew we'd want to spend a lot of time in the mountains and didn't want to restrict our access to certain areas. Secondly, we were aware that 6 metres tends to be a cut off value for various tolls, tickets and ferries and we wanted to keep running costs down. (We had read that in some cases, like ferries in Norway, costs could be significantly more sometimes double). Thirdly, a larger motorhome generally meant lower mpg (some had single figure mpg). This would not be as much of an issue for discrete trips now and then but as we were planning an extended trip around Europe, lower mpg meant more fuel over the year and this cost could also start to add up significantly. Initially we had no upper limits on either, but when we started to narrow in and had a choice occasionally we added a 20 year/100,000 mile limit to our searches. (On the whole these two options were quite well correlated; older motorhomes obviously tend to have higher mileage). Preferably, within our prefer budget, we were still looking for a motorhomes that was less than 15 years old and/or with less than 70,000 miles on the clock but we set a higher upper value in the search, just as we'd done with price, so that we could still catch any 'good' deals which might lie slightly outside these parameters. We chose these figures based on our impressions/gut feeling of what seemed to be available at the time. Another reason for this was partly due to our awareness that resale might be important to us and our observation that there seemed to be, even at this bottom end of the second hand market, a further price drop off above these limits. If there was a chance we could get a years adventure out of van without exceeding those thresholds it would be nice. Again, we were open to all options initially. We thought we would prefer a van conversion over a coachbuilt, assuming they'd be more manouverable and less conspicuous in cities but realised we would have to compromise on age and mileage as van conversions tended to be more expensive (and hold their value better) than coach builts and A class. However, we did keep an open mind when searching and we did buy a coach built in the end. The only refinement we made in this search option was to evetnually not include self-built motorhomes or disregard them if they did come up in our search results as we were unable to find a company who could insure us for our situation at a reasonable price. So although they offered better value for money, the cost saving for us was lost by the increased insurance premiums quoted. Again as reliability was so important to us and we saw this as potential indicator that a motohrome had been looked after. If this was a search option we ticked yes to see if this narrowed down results or alternatively it would be one of our first line of enquiries when we called a seller in response to a particular add if it was not mentioned. We wanted to find out that a vehicle had been maintained regularly and what additional works had had to be carried. Also we asked specifically about the motorhome tyres. After reading online about the importance of motorhome tyres being replaced regularly i.e. after 5 years even if the tread is ok as motorhomes are not driven as much as cars; when rubber gets old, the side walls maybe starting to suffer from cracking and that some people compromised on not putting the appropriate van/motorhome tyres on these were also questions we would ask. After refining all of the options listed above there usually weren't that many motorhomes left to choose from at the point in time we were looking. Depending on the website we were searching on we might have a shortlist of somewhere between 20-50 motorhomes left that weren't too old, had a reasonable mileage, good condition, partial or full service history and were less than 6m in length. But it was clear that internal layout and specific extras was an area we would have to be flexible on if we wanted to stay within our other van related criteria, which, to us, were much more important. The only area we couldn't compromise on was having a decent bathroom due to my health problems. We wanted a room we could use easily with the door closed. This did rule out some motorhomes which didn't have a toilet at all (except for a porta-porti which could be pulled out of a cupboard) as well as motorhomes which had very compact toilets where it was hard to sit inside and also shut the door. A shower and/or separate shower area was a luxury but a toilet and a bathroom which you could comfortable spend 45 mins in unfortunately wasn't for me. 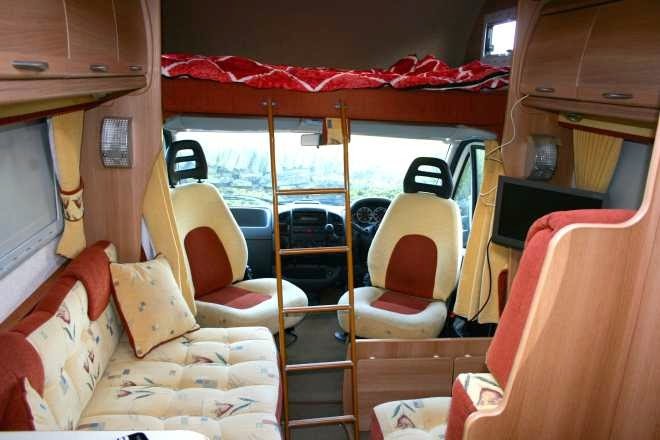 It was also quite important to us to have 2 captains chairs as they hugely increases the habitation living space of the motorhomes less than 6 metres. This ruled out some of the older van conversions as they had fixed driving and passenger seats and we knew we wouldn't have the time or extra money to be searching for and fitting ones ourselves. After this the main variations in the habitation were whether they had a rear or forward positioned seating area, overcab bed (which we didn't want as we thought it was too large) and where the kitchen was positioned. But to us all of these variations were secondary to whether the habitation was in good condition and had been well cared for. We didn't have an ideal layout in mind for us. Other internal features which some guides encourage you to think about, weren't as important to us or practical to want given our other requirements. Whether a motorhome had a TV with satellite, or a full sized oven, more than 2 gas rings, the size of the fridge etc. Even storage, as long as it had a 3 or 4 small cupboards was a big preference of ours as we knew we would adapt to what bought and were quite looking forward to going minimalist! The one thing we did think about was a fixed bed. Reading the guides and given that we would be living in the motorhome for an extended period time this feature made sense and would have been preferable but wasn't made an essential criteria for us. If a motorhome met our other criteria above and it had a fixed bed, great but it wasn't something we were willing to pay extra for. 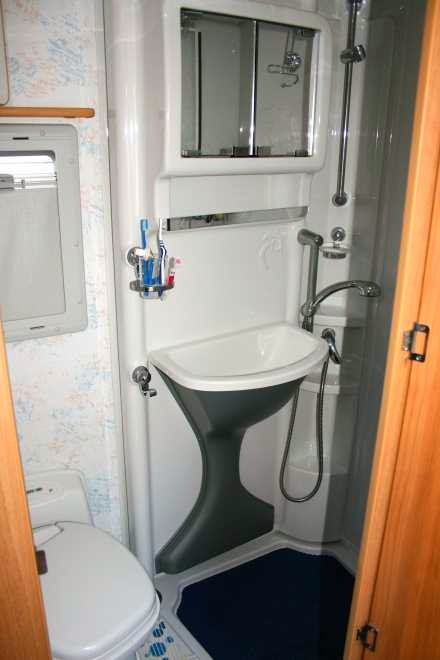 There weren't many 6 meter motorhomes with a decent sized bathroom and a fixed bed on the second hand market. These tended to be newer van conversions and were not in our price bracket. As with the seating area and kitchen area we were flexible on this. Bike rack, solar panels, extra leisure batteries, outdoor storage boxes, awnings etc. were all nice sounding extras, we were not worried about these. 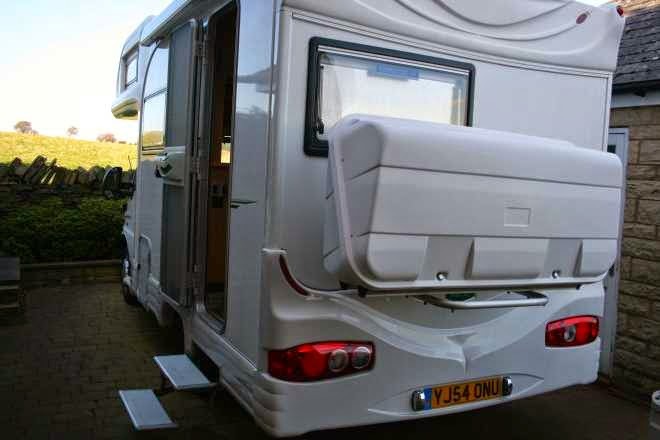 We'd take a special interest in those motorhomes which already had a bike rack fitted but with so few motorhomes left to choose from it was unrealistic to expect to choose extras like these and stay within our budget. They would have been nice, but were minor considerations as we could fit ourselves if we decided we needed them in the future.